Many customers asking to know the difference between the plaster coving we sale and the one they sell at D I Y stores or similar. 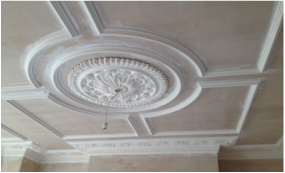 ​Coving Shop Ltd manufactures and provides premium plaster coving using the traditional methods. All premium plaster coving is handcrafted without any mould release agent, so there is no need for oil sealers or primers when the coving is installed and ready to be painted. Instead only one coat of ceiling paint is required. It is perfectly made to a ninety degree angle so it fits easy by making invisible joints. Also this makes the installation process very easy and suitable down to a handyman. Plaster coving bonds to plaster wall or concrete wall nicely without using expensive adhesives and fillers. We also have an installation guide that will help you to make the installation process very simple. Please note our plaster coving and all our plaster products are made in our own coving shop and we are proud to say is - made in Britain. We only use British top quality fine superior gypsum plaster, all products comes with life time warranty.